#704 Manual Uncoupler made in 1949 thru 1959. 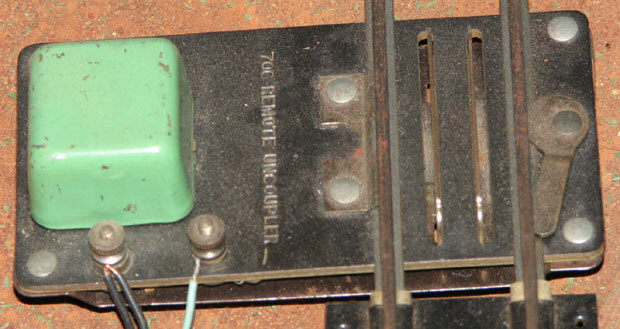 #705 Remote Control Uncoupler made in 1946 & 1947. Black housing mounted on a straight track section with black rails. 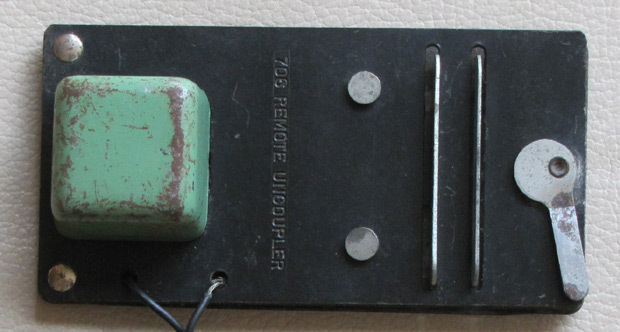 #706 Remote Control Uncoupler made in at least seven variations, of which Greenberg mentions only five. The TM Guide says it was made from 1947 thru 1956; Greenberg and Doyle say 1948 to 1956. Above is the initial, short-lived design. It is not listed by Greenberg. 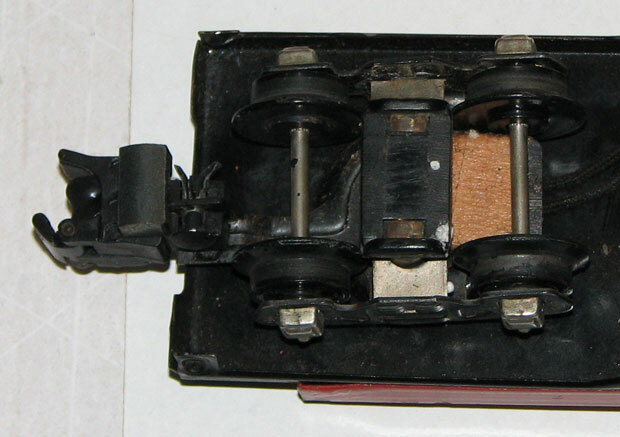 The solenoid housing was brass painted black; later versions (see below) were tin painted green or yellow. Look closely at the two bars that do the actual uncoupling: their tops are bent outward; all the later versions simply have straight up bars. David Dewey offers this commentary: “The housing is brass, painted black. and the stamping was more expensive, so the straight bars were introduced. Doug Peck reports that he has a couple of these with black brass housings but straight up bars. Gilbert probably had an inventory of brass housings to use up when they changed the design. Greenberg called this “Variation A.” Note the straight up uncoupling bars. It has a green tin housing, binding posts for the wires, and a sheet metal strip securing it to the rail. Those are the three things that distinguish the five variations documented by Greenberg. Variation B is the same except the housing is yellow. Variation C is the same as Variation A except it has wires permanently connected instead of binding posts. 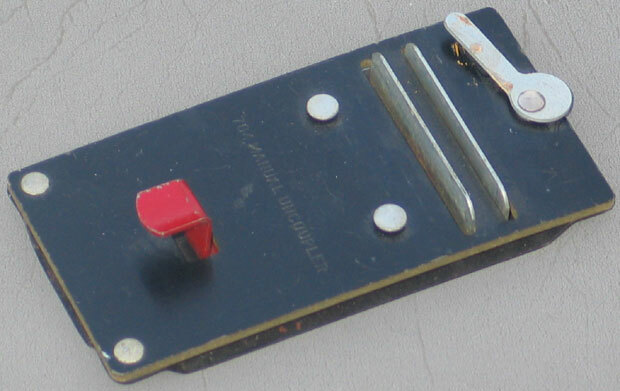 All five variations came with a black-body control with a red button and white lettering. Variation D is the same except the housing is yellow. 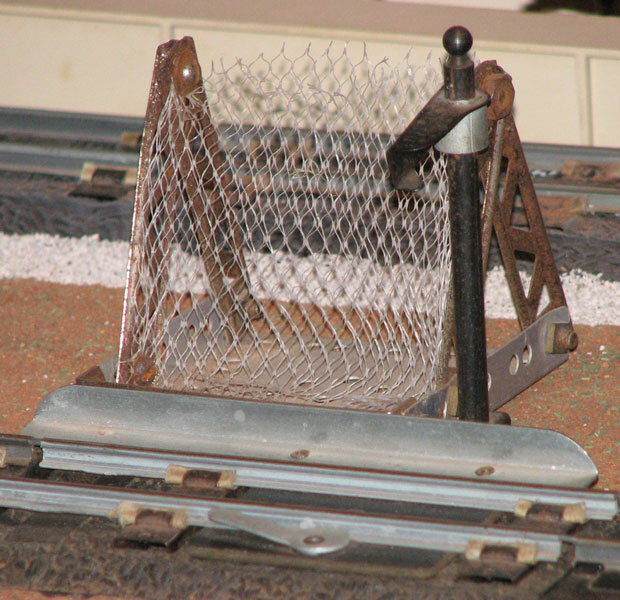 Variation E is the same as Variation C but it is secured to the rail by two pins rather than a sheet metal strip. 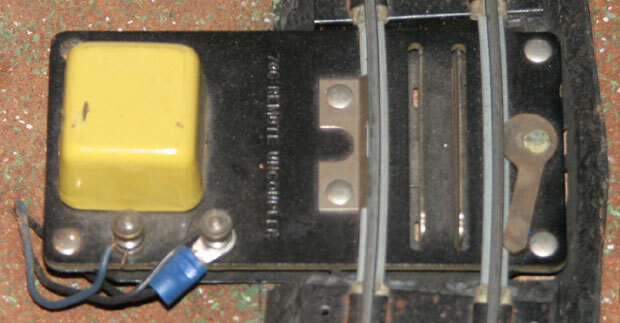 Initially, Gilbert included a piece of straight track with each uncoupler and packaged them in a long box. If anyone has one of those boxes and can send me a picture, I'd appreciate it. Later, no track was included and it was packaged in a small box with instructions printed on the top. 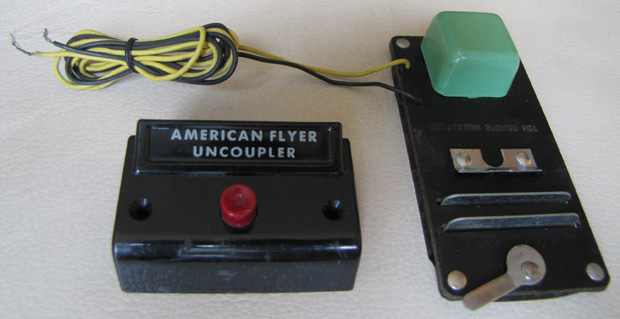 Printed on the bottom of the box was a drawing of the uncoupler. This box was for Variation A or B – note the binding posts. 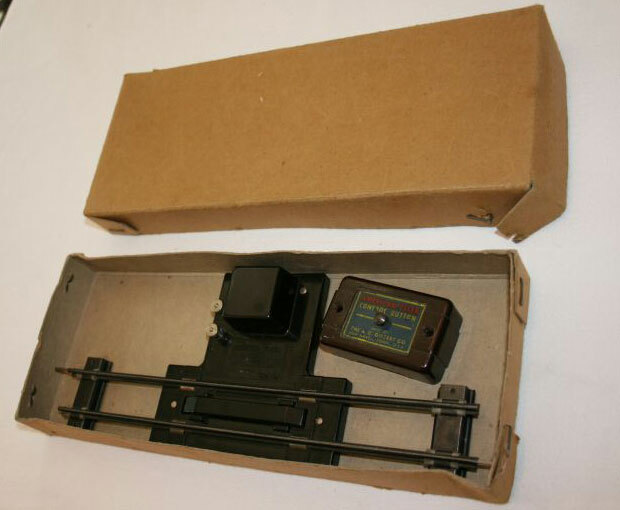 This is a later box; note that the Rectiformer instructions have been deleted. This one is for variation E – note the two rail holder pins. The drawing appears to have two binding posts, but the verbiage refers to the connected wires. made in 1946 thru 1959.
or in some other situation that requires connection to only one rail. 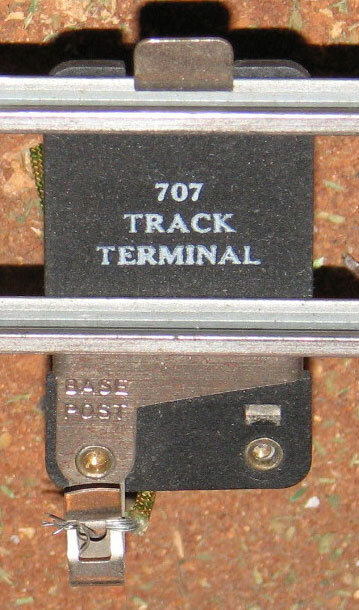 #710 Automatic Track Section with two inside contact rails made in 1946 & 1947. Operating cars made in 1946 had an inside power pickup like this. 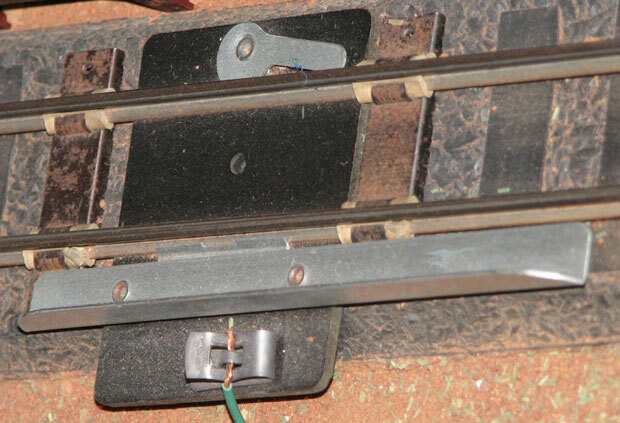 The two inside rails of the #710 Automatic Track Section provided power to these contacts under car. #711 Mail Pickup with two inside rails for contacts made in 1946.
but has two inside rails like the #710 Automatic Track Section above rather than the outside rail of the #713. #712 Automatic Track Rail made in 1947 thru 1957. It was sold with a variety of operating boxcars, flatcars, and hopper cars. Here it is with the #971 Lumber Unloading flatcar. 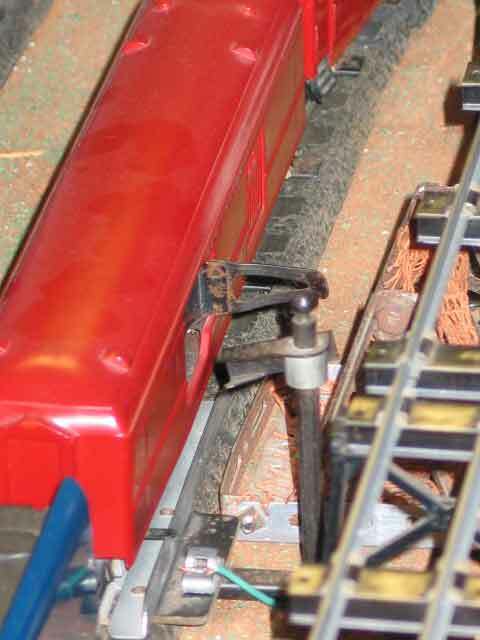 The car gets one side of its power from the rail connected to the transformer's Base Post. The other side comes from the #712 Automatic Track Rail via a finger sticking out from one truck. The wire connnects to the operating button that comes with the car. #713 Special Rail Section made in 1947 thru 1958. It was sold with the #718 and #918 Mail Cars. to hold a mail bag for the passing mail car to pick up. Behind it is the mail bag catcher my dad and I made from my Erector Set when I was a kid. Unlike the other operating cars, the mail cars operate with the train moving. The Mail Car tosses one mail bag out and grabs another off the #713 pickup arm as it passes by. Notice the power pick-up finger extending out from the truck as it does on the flatcar above.